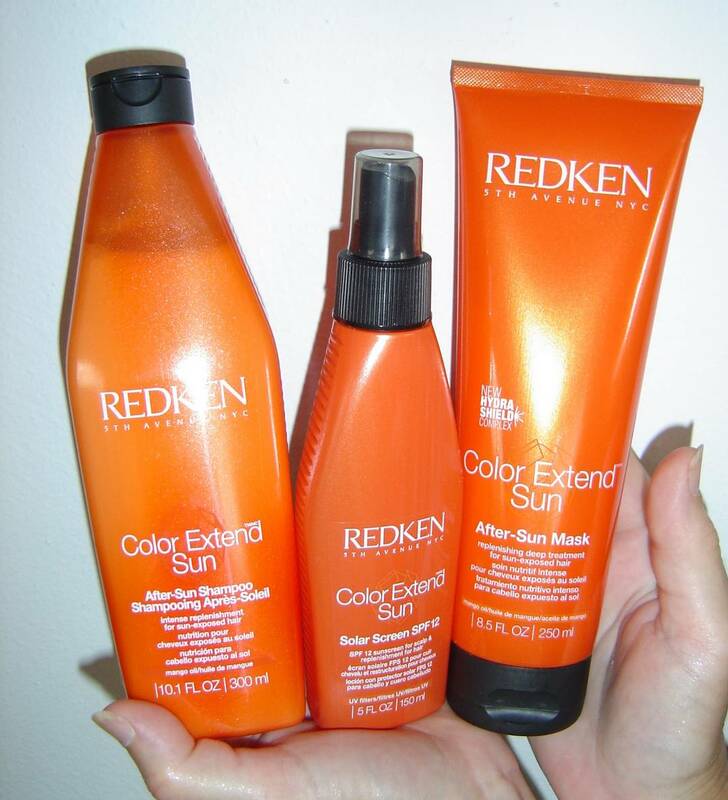 The hair miracle workers at Redken 5th Avenue have developed new products to help defend your hair from sun damage with their Color Extend Sun Hair Care Line. You can say a good-bye to sun-fried hair now and in the future with these three fantastic products that I recently tested for this review. Let me start by saying how thrilled I was to learn about this new system since it means I can go hatless if I prefer and stop worrying about ruining my hair in the sun or when swimming from salt or any chlorine. Now how great is that bit of news! I do have a large brimmed straw hat that I wear when spending extended time in the sun. However, though my hat is pretty with ornate trimming and a slight slant to the brim, I sometimes neglect to wear it when I have an exceptionally good hair day and hate to crush it. Vanity can leave you with a problem of straw-like hair before you know like it did with mine again until these products arrived. The Color Extend Sun Hair Care Protection Line has a special Interbond Conditioning System and an Advanced Hydra-Shield Complex with Soplexyl, which later I discovered does amazing things quickly for crispy, color-treated hair like mine with unbeatable continuous protection even once it’s rinsed out while returning the lost moisture and incredible gloss back to your hair. Once my box arrived I went to work on my damaged hair that was lifeless and crunched when touched so I grabbed the Color Extend Sun After-Sun Shampoo. I loved the fantastic fragrance of this product in this rich formula and followed with the award-winning Color Extend Sun After-Sun Mask, the deep conditioning treatment with mango oil and ceramide to revive that mass of straw that was on my head. I used the maximum amount of time of 15-minutes to keep the After-Sun Mask on my hair before rinsing out. Once I finished drying my hair, I felt new vitality return. The next day I used the Color Extend Sun Solar Screen SPF 12 Spray first before going out in the sun to see how my hair would hold up. The instructions mentioned applying it to dry or slightly damp hair thirty minutes before going outdoors. I am glad to report when I returned home my hair still felt as soft as before I left. I washed again with the After-Sun Shampoo and followed once more with the After-Sun Mask and my hair became even softer with a more magnificent shine. In fact, I can honestly report that with each use of these three Color Extend Sun Hair Care products, the more glorious my hair looked! Next Post Are You in Need of Some Instant Energy?